Interesting, I’m sure you’ll agree. This has me wondering what normal is? I mean, uBiome’s norm when looking across all their samples, I wonder what that looks like. I don’t know the answer to that at the moment, and it may not be that relevant for the average person, but if you’ve been on antibiotics or had some other loss of gut diversity then it would certainly be useful to know. Though even some results from just a handful of “healthy” people would give a fair indication, I’d bet. It is almost certainly an improvement that I now have twice the level of species diversity I had a year ago (leaving aside which species these actually are, as that is also likely important), but how much further have I to go? Is the norm 100, 150, or 500? If you’re reading this and you have taken a uBiome test then I’d love it if you posted your stats for comparison. It’s quick and easy. The easiest and quickest way to find this info is to click “Raw Taxonomy” in your uBiome dashboard. Then Ctrl+F to run a search for “phylum (beware that Subphylum and Superphylum will be counted if you don’t specify the leading inverted commas in your search) and then “class – “order – “family – “genus – one at a time and see how many hits you get in each case. I suggest using Chrome browser rather than Firefox which won’t return more than 100 hits. Alternatively you can put your results into a spreadsheet, great instructions for which can be found on Richard Sprague’s blog. This option makes it easy to get those counts but also to manipulate your data in any other way you fancy going forward. So do me a favour and post your diversity counts. The disappearance of C. butyricum is interesting, it can be pathogenic but it is also widely used as a pro-biotic in Asia as a treatment for it’s misbehaving cousin C. diff. And as you can guess from its name it is a butyrate producing bacteria. Last year C. butyricum made up more than 1% of my total gut flora, which is much more than usual. Now it is gone. 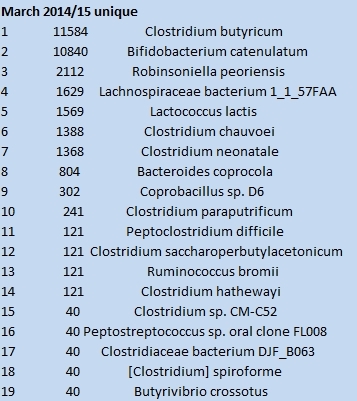 In fact, many of my clostridium have been kicked out, half of these now-extinct species are clostridium, many of which are normal in the human gut but also can be pathogenic. Last year the clostridium genus made up 8.63% of my gut whereas now it is at a normal level (1.56%), so probably good on the whole. B. catenulatum is gone too, which seems a shame. I guess it has been out competed by the other species of bifidobacterium that I introduced over the last year. L. lactis, often present in dairy products such as cheese, is gone. Why? No idea. I’m pissed to see R. bromii is gone. It’s considered a cornerstone species and I was pleased that after my antibiotics, when I first tested, there was a tiny amount still holding on. But now it is gone. Why are my ruminococcus abandoning me? I’ll be looking at which cornerstone species are missing from my gut next. R. bromii is not the only one, and these key species being absent does not bode well for my future gut health. That aside for now, when you consider that these 19 species pictured above were missing from my second sample, it makes my increase in species level diversity even more impressive! I started with 55 species, lost 19 of these and gained 73 new species. I must be doing something right – or at least, More things right, than wrong! Congratulations on the improvements, and thanks for posting these great details. Hey, thanks so much for taking the time to post your diversity, I really appreciate that! Interesting to see it visualized on your graph like that. I suspect that diversity and combinations are both important. But I probably wouldn’t be too worried about diversity had it not been for the obliteration caused by the antibiotics I was on. The thing is, now that I am a year post antibiotics, and I can see my gut has more diversity than it did before, and there are some signs of recovery, I am asking myself the question, At what point do I stop worrying about that angle? Looking at your results as a comparison is handy and suggests I may be there, or close to being there already. Of course, I’d love to compare with a couple more results from other people too, but hopefully you’ve encouraged them by posting yours! You think they’d be able to give us a capsule which would dissolve in the gut and repopulate with the right diversity by now, wouldn’t you? I want the same as my skinny healthy younger sister has, please. Yes – but they’re hit or miss. ‘Healthy’ people are not all alike. ‘Sick’ people don’t need the same solutions. I want one from someone who is naturally slim, has a huge amount of energy, and can eat whatever they want. Certified. Indeed, long way to go before we can fix gut flora well, unfortunately. I’ve really enjoyed reading your blogs on gut flora and uBiome results. So much interesting information! I have just received my results from uBiome and I have to admit at being at a loss interpreting them! I can get a basic overview but would really love to understand about the individual types of bacteria and if they are healthy or not. Do you know of anyone that can look at a persons results and break them down at all? Will give it a try. Thank you!